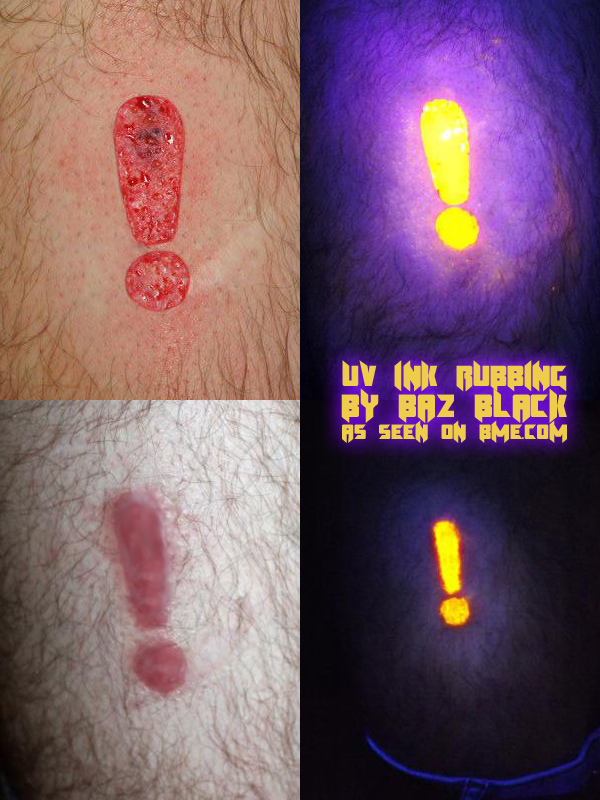 Dundalk, Ireland’s Baz Black (facebook.com/BazBlackPiercing) did this UV ink rubbing over a skin removal scarification of an exclamation mark. The top row shows the scar as it was fresh, back in December, and the bottom row shows it as it is now, seven weeks into healing. In an attempt to get the ink to stay more solidly, he had the customer come back every day for the first three days of healing, so he could change the dressing for him and reapply the UV glow ink each time. There’s a little bit of patchiness, but overall the effect is very solid. This entry was posted in ModBlog and tagged Flesh Removal Scarification, Ink Rubbing, Skin Removal, UV Ink by Shannon Larratt. Bookmark the permalink. White ink DEFINITELY does not cause cancer — in fact, in most cases it’s one of the more inert (ie. safer) types of tattoo ink. As to UV ink causing cancer, there’s no evidence to support that either. Some kinds of UV ink may not be as inert as one would like, but other kinds (such as the micro-bead encapsulated types) are much safer. WOW! What an awesome result! How exactly was the ink applied? Looks like he has a quest to give!